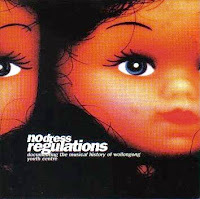 Released in 1997, No Dress Regulations was a project of the Wollongong Youth Centre using a funding grant from the NSW Ministry of the Arts. A pivotal part of the local music scene, the Youth Centre provides rehearsal space and serves as a much needed venue for all-ages shows in the area. The album compiles 26 of the bands and artists who utilised these services between 1993-1996 and sonically runs the gamut from punk, metal, hip-hop, singer/songwriter and indie - clearly demonstrating the diversity of the city's musical culture. Despite the many styles on display, the album runs relatively seamlessly, much to the credit of local producer Brent Williams - whose name you'll find in numerous local album credits. The album is an interesting historical document showcasing the state of the many local scenes in the 90's. A particular highlight is the early sound of Thumlock - a band who went onto sign with the now-defunct High Beam Music, and garnered a strong following not only locally, but nationally and overseas also.